Clients deserve to have the right plan, deploy the right strategy and the right mixture of tactics most appropriate for their business! So here’s a guide whose aim is to help you construct a marketing communications plan or a marketing plan as it is known to many people. You can download it by clicking on the image link below. A plan which will give you a “bigger bang for your buck” because it captures all the elements that will give you the best chance of creating a winning customer engagement formula for your business. 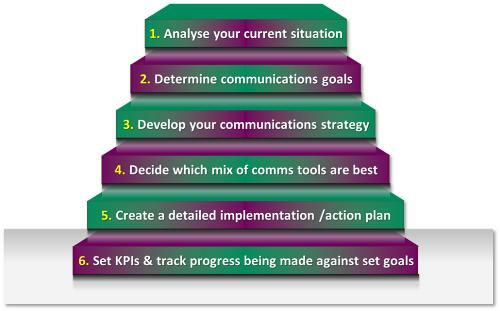 Whether your business is B2C, B2B, small, medium or large – the 6 STEPs are relevant and applicable! And you can do what I do and make it as simple or complex as required to suit your business – be it 4 sides of A4 paper to an in depth planning document complete with detailed analytics. Good luck and best wishes in your hunt for more profitable business! 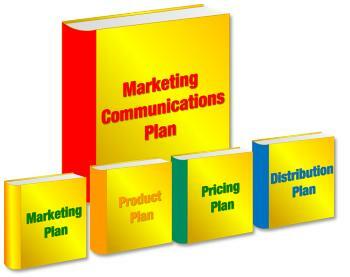 Marketing plans provide a foundation for establishing all the strategies and tactics that you deploy in your business. Of these, the most well known and one which is most often referred to as “the marketing plan” is the integrated marketing communications plan. to use media like blogs, brochures, press releases, web sites,& social media etc ..
for building awareness of a company and its products and/or services in order ..
to instil a distinctive and preferential perception among its customers which .. The use of the word “integrated” is key! Invariably a blend of different approaches to different customers or decision maker types will be required to achieve a company’s objectives. Integrating marketing communications ensures that all forms of communications and messages are carefully linked together so that they work in harmony in a seamless program to maximise the impact on prospects and customers at an optimal cost. B. Why Planning Is Important! Having a marketing communications plan to guide your marketing efforts is important to help you stick to a schedule, gauge the results of your marketing, and stay within budget. Your plan needn’t be long winded or include masses of statistics or charts – just keep it simple. This will make it easy for others who have to help you implement the plan understand it so they can act on it with ease.